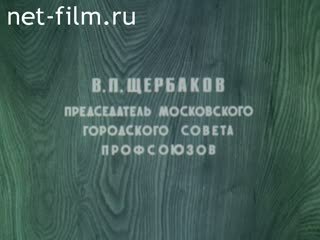 Operators: Baykov V., Golovnya V., Goncharov L., Gorbatskiy V., Grigorev N., Ivlev U., Izvekov V., Istomin A., Kuzminskiy S., Kuznecov I., Lebedev A., Makarov V., Maksimov L., Myakishev G., Nikonov V., Filatov V., Filatov I., Khodyakov V.
About the XVIII Congress of the USSR Trade Unions. The participation of delegates from trade unions in the work of the XXVII Congress of the CPSU; I. Zakaria gives Congress the revolutionary banner of the World Federation of Trade Unions, speech Gorbachev. The work of trade unions, a year after the XXVII Congress of the CPSU; interviews with members of trade unions. Delegate XVIII Congress of Trade Unions, a milkmaid Latvian farm "Ogre" Inessa Asare on a train - MS., PNRM., CU. Inessa daughter in kindergarten playing with children - CU. Asare II meets his daughter, takes her home - MS. (Winter). Central homestead farm "Ogre» - LS., PNRM. Asare family home - MS., CU. Janis Asare at work on the farm - MS., PNRM. I. Asare gives fodder to cows, cows eat - MS.
Cow with calf - CU. Asare II removes the milking machine is on barn - MS., LS. I. Asare home gives interviews (synchronously) - Various. Opening of the XVIII Congress of Trade Unions: delegates applauded, are members of the presidium - different. A summary report of the All Chairperson of SA Trade Unions Shalaev (synchronously). The logo of the Congress, sculpture VI Lenin - MS., LS., Hitting. Red Square - LS. with a / t, impact. Delegates Congress of Trade Unions lay a wreath at the Mausoleum of VI Lenin's Mausoleum are - different. Car assembly on the assembly line automobile "GAZ» - LS., PNRM. Construction of residential buildings - LS., PNRM. Delegates XVIII Congress of Trade Unions on the sidelines - different. Speakers: the chairman of the Moscow City Council of Trade Unions VP Shcherbakov, chairman of the Latvian national council of trade unions, AK Zigmanis, chairman of the regional committee of trade unions Ipatovsk VI Avdeev (all simultaneously). Kremlin - MS., Departure., PNRM. Marx Prospect - MS., Departure. Posters on the street: "The participation in the reconstruction and acceleration of the revolutionary renewal of the country - the most important task of the Soviet Union", "Trade unions - School of Management, School of management, school of communism» - MS., Hitting. Delegates Congress of Trade Unions standing welcome MS Gorbachev - MS., PNRM. Persons delegates of different nationalities. The participants applauded - MS., PNRM. On the sidelines of the congress are interviewed: chess champion Kasparov, delegates VI Fellows and PI Khukhrianskii (all simultaneously). On the sidelines of the congress delegate interviewed NS Stepanyan (synchronously) - MS., Hitting. I. Asare in the lobby, and is talking to other delegates - MS. 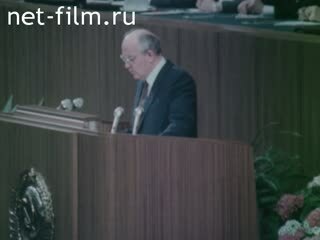 Continuation of MS Gorbachev (synchronously). Hit a sculpture VI Lenin in the hall - LS. 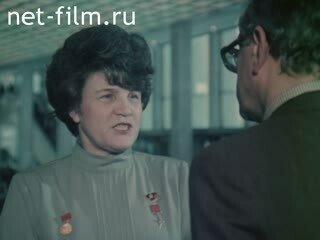 Speaker: Managing trust "Mosoblselstroy» № 18, Hero of Socialist Labor N. Lieutenant (synchronously). Listen to the podium and Hall - MS., CU. Chairman of the Union NLMK SI Verigin is interviewed on the sidelines (synchronous) - CU., Hitting. Interviews provide delegates driver from the Kaliningrad region and the woman (synchronously) - CU., Hitting, PNRM. Melting at NLMK - LS. Steelworkers at work - MS., PNRM., CU. SI Verigin in the shop - CU. Is rolling - CU., LS. People swimming in the pool factory - MS., PNRM. Workers drink tea in the lounge Motor Transport Department - MS. The stadium, train people - MS., LS. Dancing in the culture of the 1st State Bearing Plant ("Gypsy" dance, dance, masked men, etc.) - MS., CU., PNRM. Delegates Congress of Trade Unions watching and applauding - MS., CU., PNRM. 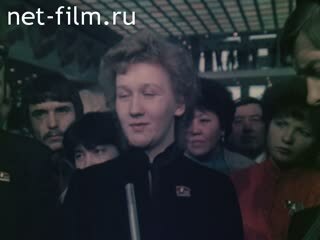 At the congress of trade unions are: People's Artist of the RSFSR, ID Kobzon foreman Chelyabinsk Tractor Plant A. Karachun, National Teacher of the USSR NN Beloshteptova (all simultaneously). Weaver of Hero of Socialist Labor V. Pletnev is interviewed on the sidelines (synchronous) - CU. VN Pletnev at work at the machine - MS., PNRM. Weaver adds yarn - MS.
Flax shop - LS., PNRM. Tractor out of the shop - MS. (Chelyabinsk Tractor Plant). Stand ready tractor - LS. Work teams A.Karachunova considering drawing - MS., PNRM. Says A. Karachun - CU. Congress of Trade Unions welcome vocational school students, giving flowers to the members of the Bureau, are the critical remarks (synchronous) - Various. Removal of the banner - LS., Departure. Guests of the Congress of Trade Unions of Africa at a garment factory - MS., PNRM. Other guests at the shop of the plant - LS. Delegation of German Machine Tool Factory workshop examines the Ordzhonikidze - MS.
At a meeting with the workers of the plant stands representative of the trade union of Germany Hans Schaeffer (synchronously in German) - MS., CU. hearers. Applauding delegates - MS., PNRM. (Simultaneously in English) - CU. I. Zakaria presents SA Shalaev banner WWF present applauded - MS.
Foreign visitors to the sidelines, put their signatures - MS., PNRM. Foreign guests - close-ups of faces. SA Shalaev said on the sidelines of the delegates - MS. I. Asare is interviewed on the sidelines (synchronous) - CU. At the Congress, were members of the Academy of Medical Sciences of the USSR SN Fedorov (synchronous) - CU. Acts foreman of the mine "Raspadskaya" B. Gvozdev (synchronously). Miners with torches are on mine "Raspadskaya» - MS. Operates coal combine - MS.
Conveyor and coal - MS.
B. Gvozdev at work in the mine - CU. The Grand Kremlin Palace - LS., Hitting. Chairman of the Presidium of the Supreme Soviet of the USSR AA Gromyko presents the Gold Star of the Hero of Socialist Labor Vladimir Gvozdev, foreman of the mine "Vorgasherskaya" A. Potapov, the master of Surgut Petroleum V. Sidoreyko. Says V. Gvozdev B. Sidoreyko (synchronously). B. Sidoreyko and others working on an oil rig rise - MS.
Oilman of the work - MS.
B. Sidoreyko with members of his team - MS.
B. Sidoreyko, Potapov, V. nail in the lobby of the Congress of Trade Unions - MS., CU. The congress delegates are photographed together - different. Photo delegates - MS., LS. Winter landscape (from the train). I. Asare at the window of the car train - MS., PNRM.